Pain à l'ancienne is not actually a type of bread, but rather a technique for making bread. The technique uses delayed-fermentation. Delayed-fermentation means that you make the dough then delay the fermentation by retarding the action of the yeast by chilling the dough. Ice water is used to mix the dough and then the fridge is used to hold the dough overnight. It is an easy method producing a deliciously different tasting result. I think that you could use the pain à l'ancienne method with any bread recipe, but I have not yet tested this theory. The recipe I used is from the book The Bread Baker's Apprentice which I can highly recommend for all aspects of bread baking - recipes, explanations and techniques. Make a dough from 3 cups of stone-ground unbleached flour, 1 teaspoon of salt, 1 teaspoon of dried yeast, and just over 1 cup of ice cold water. Add more water as you go if required to make a very soft almost sticky dough. Transfer to a lightly oiled bowl, cover with plastic wrap and put in the fridge overnight, or the equivalent. Take the bowl out of the fridge and leave at room temperature until it has doubled in size from the size it was when it went into the fridge. Gently transfer the dough to a generously floured bench, trying not to deflate the dough. Carefully shape the dough into a rectangle. Flour your hands and the bench as necessary. Cut the dough lengthwise into three, being careful not to degas the dough. Leave the dough to rest for 5 minutes. Heat the oven to as hot as possible (250°c), putting a baking stone in if possible and a metal container for steam. Put the dough on baking paper or a Teflon sheet and shape the pieces of dough into baguettes by gently stretching them the length of the baking sheet or stone. Slash each baguette with an extremely sharp knife or razor blade. Put in the oven, adding water to the steam receptacle. Turn the oven down to 225°c and bake for 10 minutes or until the loaves look good and sound hollow when rapped on their bottoms. Leave to rest for at least 20 minutes. This part is the hardest but it is very important because this is considered the final stage of the baking. The structure is still changing, the flavour is still developing. Slice or break and enjoy the different, more nutty flavour of the bread produced by the pain à l'ancienne method. It is wonderful with some freshly made butter. This savoir-faire makes me jealous. The breads look great. I am more curious to hear about the book. Alors la c'est super drole, mais tu ne vas pas t'en tirer comme cela. Que dis-tu de faire ce meme exercice en anglais. Je viens de te "tagger" dans mon post. Check it out! Oops, left a part of my message for another blogger I tagged ahahah, you can practice your French here! I love this bread. Others around my house call it 'magic bread'...in slightly awed tones, of course. 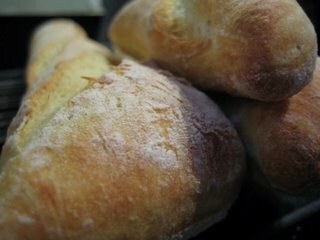 I've used the method for a number of bread types and my conclusion is that it works better on simpler breads than on those with lots of flavor to begin with. Meaning that if I am using all (or mostly) white flour, I sometimes do the cold water--straight to fridge style, but if it's some whole grain creation, not so much. Although most of my breads do get at least one overnight retarding in the fridge. If you're a fan of Reinhart, you might want to check this out. He's looking for recipe testers for the next book. It is magic bread, what a perfect description. Thanks for your comments it is great to hear from someone who has such experience. On your recommendation I have emailed Reinhart and have my name on his recipe tester's list - thanks so much. That is very exciting for me! Are you involved too? Hi Bea! I feel it maynbe too late for me to join the meme but it is never too late to practice my french right!? I have often used this method of overnight fermentation - but usually with a preferment rather than the whole recipe. And it never occurred to me to use ice water when making the dough for the retardation of the yeast. Also, I NEVER oil the rising bowl. I've found it's just not necessary. The risen dough just slips right out of the bowl. In the winter, I leave preferments (sponges or bigas) on the counter overnight. In summer, they go in the fridge. You might also be interested in reading (and trying the recipes) in Artisan Baking Across America: The Breads, The Bakers, The Best Recipes by Maggie Glezer and/or The Italian Baker by Carol Field. Both have really great descriptions of making slack-dough bread. P.S. I have just discovered your blog (via Cook Sister's EoMEoTE#14). Thanks so much for your comments - they are very interesting. Book suggestions are so useful, I will check them out. I must remember not to oil the bowl and see how that works out. I have suspected the oil affects the shaping of the dough . . . I don't think the lack of oil does anything at all with regards to shaping the dough. And just so you don't think I'm talking out of my hat, I always USED to oil the bowl when I made my mom's sandwich bread. But once I forgot and noticed that there was no difference at all. It's so much easier to just put dough into a clean bowl instead of having to oil it first. Oops, I meant to type "...put dough for rising into a clean bowl..."